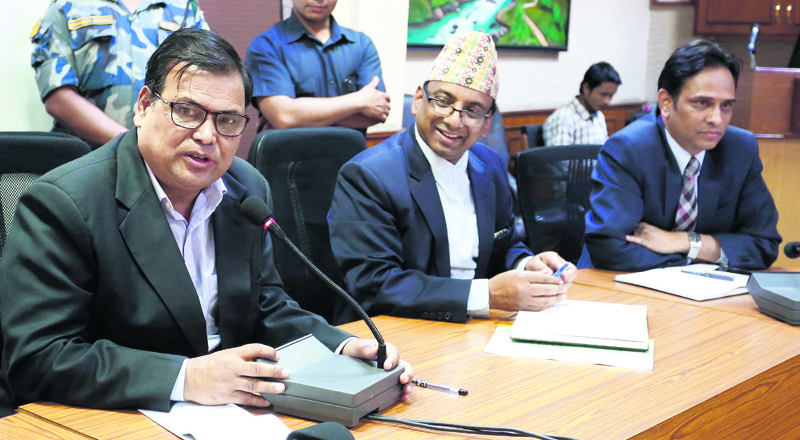 Minister for Finance Krishna Bahadur Mahara (left) speaks at a pre-budget discussion held at the Ministry of Finance in Singha Durbar, Kathmandu, on Monday. KATHMANDU, May 23: The government has forged political consensus to table the budget on May 29 as stipulated by the constitution. Clearing doubts about the government's budget and programs in the middle of two elections, Minister for Finance Krishna Bahadur Mahara on Monday said that political consensus has been reached among major political parties to bring a full-fledged budget. Talking with media persons at the Ministry of Finance, Mahara also made it clear that there would be no new programs in the budget. He, however, added that the budget will be a step forward toward institutionalizing federalism by directly allocating grants to the local units. “Local units will function on their own. They are free to select programs and projects. This is a part of implementing the new constitution,” Mahara said. The other priorities of the budget for the Fiscal Year 2017/18 are national pride projects and other prioritized infrastructure projects. Likewise, the budget will also make significant allocation for reconstruction work, according to Mahara. The government is allocating grants to 744 local units based on the budget allocated for existing projects and programs in each local government. Finance Secretary Shanta Raj Subedi said that they have planned to allocate budget for general election as well as the election for federal units to be held within 2018. Subedi also said that preparation for formation of National Natural Resources and Fiscal Commission is also underway. The commission, as provisioned in the constitution, will recommend the government for equitable distribution of resources to local units based on population, geography and other development indictors. Though the government is encouraged by growth projection of 6.9 percent -- a record in two decades, Subedi said that the expanded base of gross domestic product will make it difficult to sustain growth of the current fiscal year. The government has fixed budget ceiling for the coming fiscal year at Rs 1,156 billion. The budget session of the parliament began from Monday. Will new government bring another budget?